The political landscape of the United States is dominated by two major parties, the Democrats and Republicans. Though there are some differences between democrats and republicans, it’s next to impossible to classify everyone based on every political issue, there are many specific important points that members of each party agree with. These important points are generally found in each party’s platform. In order to understand the fundamental differences and beliefs of each party, we must look at the histories of Democrats and Republicans to understand their motives for becoming a party. It is also necessary to understand their fundamental beliefs and positions and how they have stuck with these positions through their voting records. The party can trace its roots all the way back to Thomas Jefferson when they were known as Jefferson’s Republicans and they strongly opposed the Federalist Party and their nationalist views. The Democrats adopted the donkey as their symbol due to Andrew Jackson who was publicly nicknamed “jackass” because of his popular position of “let the people rule”. The Democratic National Committee was officially created in 1848. During the civil war a rift grew within the party between those who supported slavery and those who opposed it. This deep division led to the creation of a new Democratic party, the one we now know today. The Republican Party came into existence just prior to the Civil War due to their long-time stance in favor of abolition of slavery. They were a small third-party who nominated John C. Freemont for President in 1856. In 1860 they became an established political party when their nominee Abraham Lincoln was elected as President of the United States. Lincoln’s Presidency throughout the war, including his policies to end slavery for good helped solidify the Republican Party as a major force in American politics. The elephant was chosen as their symbol in 1874 based on a cartoon in Harpers Weekly that depicted the new party as an elephant. 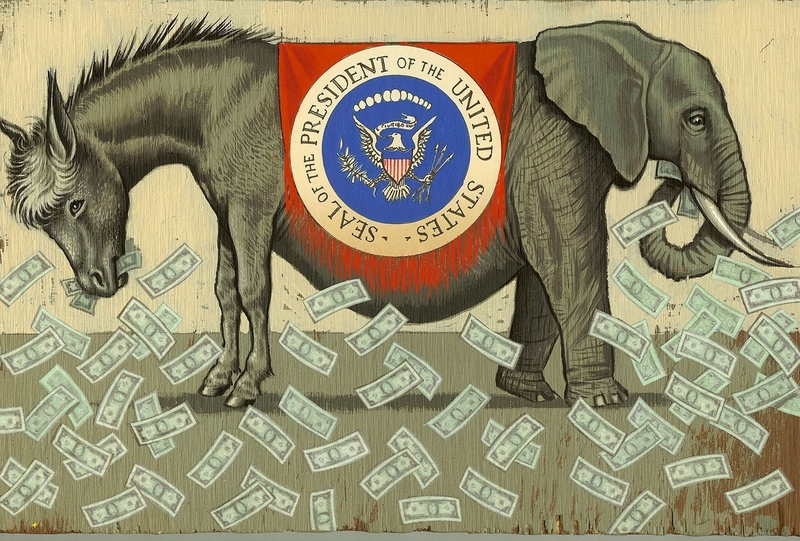 With the establishment of a powerful two-party political system in the United States—the Democrats beginning in 1824 and the Republicans beginning in 1854—there are some core differences between the two based on very strong political beliefs. Both parties favor tax cuts, but each party takes a different view on where those tax cuts should be applied. The Democrats believe there should only be cuts for middle and low income families, but believe they should be higher on corporations and wealthy individuals. The Republicans believe there should be tax cuts for everyone, both corporations and people of all income levels. One of the differences lies in their views towards social issues. The Republicans tend to be conservative on social issues. They tend to oppose gay marriage and promote marriage being between a man and a woman. They also oppose abortion and promote the right of gun ownership. Democrats tend to be more progressive in their views, favoring abortion and gay marriage, but are strongly for strict gun control laws that limit ownership. Republicans and Democrats have very different ideas when it comes to the business environment. Republicans tend to oppose increases to the minimum wage, citing the need for business to keep costs low so they can prosper and all Americans can have access to products and services. The Democrats favor increasing the minimum wage so that Americans have more money with which to purchase goods. They also favor trade restrictions to protect American jobs while Republicans favor free trade in order to keep costs low for consumers and make businesses more profitable so they can grow. Democrats generally prefer a lot of government regulation and oversight of the health care system, including the passage of the Affordable Care Act, because it makes the health care system accessible to everyone. Republicans, who opposed the Affordable Care Act, believe too much government involvement in the industry will drive up costs and have a negative impact on the quality of care that consumers receive. Democrats across the board believe that government should run such social programs as welfare, unemployment benefits, food stamps, and Medicaid that support people in need. They believe more tax dollars should be funneled into these programs. Republicans acknowledge a need for these social programs, but favor less funding and tighter control. Republicans favor supporting private organizations that support people in need. When it comes to differences between democrats and republicans, the foreign policy can not be missed. Each party has had differing stances in relation to foreign policy over the years depending on the situation. Generally speaking, when military involvement may be required, the Democrats favor more targeted strikes and limited use of manpower while Republicans favor a full military effort to displace regimes that are totalitarian and detrimental to their own people and who are threatening others. Both parties typically agree that sending aid to other countries is a good thing, but disagree on the nature of that aid and who should be receiving it. There have always been clashes between the parties on the issues of energy and the environment. Democrats believe in restricting drilling for oil or other avenues of fossil fuels to protect the environment while Republicans favor expanded drilling to produce more energy at a lower cost to consumers. Democrats will push and support with tax dollars alternative energy solutions while the Republicans favor allowing the market to decide which forms of energy are practical. The parties have different views on the education system of the country, but both agree there needs a change. Democrats favor more progressive approaches to education, such as implementing the Common Core System, while Republicans tend to favor more conservative changes such as longer hours and more focused programs. They are also divided on student loans for college, with Democrats favoring giving students more money in the form of loans and grants while Republicans favor promoting the private sector giving loans and not the government. Republicans generally believe in harsher penalties when someone has committed a crime, including for selling illegal drugs. They also generally favor capital punishment and back a system with many layers to ensure the proper punishment has been meted out. Democrats are more progressive in their views, believing that crimes do not involve violence, such as selling drugs, should have lighter penalties and rehabilitation. They are also against capital punishment in any form. Individual liberty has been sore differences between democrats and republicans. Political correctness is on the rise and many people believe that people need to be protected against themselves. Democrats have tended toward favoring legislation that restricts some freedoms, including foods we may have access to. Republicans favor personal responsibility, in that individuals should be able to choose for themselves what they do and what they do not do if it doesn’t break existing laws. Server responsed at: 04/18/2019 9:28 p.m.